The final phase of election for President of France comes to a close on May 7th. After the first round of voting, voters are left to choose between Marine Le Pen (hard right) and Emmanuel Macron (Centre). We know that Marine Le Pen stands for France leaving the EU, which would be particularly problematic given France was a founding member of the EU. The issue of leaving the Euro currency would be complex. In our opinion this is the last of the key elections in Europe this year given that there seems to be high quality candidates from both sides in the German elections later this year. 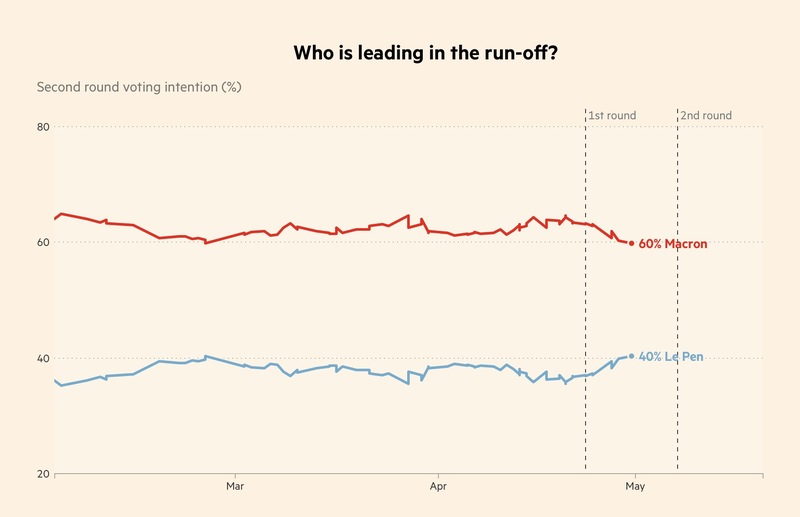 The financial markets were relieved to see the final two candidates of Macron and Le Pen, as it was earlier feared the 'Hard Left' may get through to the final round against the 'Hard Right'. The French share market rose by over 4% the day following the election result. That said, the final election result is still yet to be decided, so we thought it timely to bring you the latest thinking in this important election. 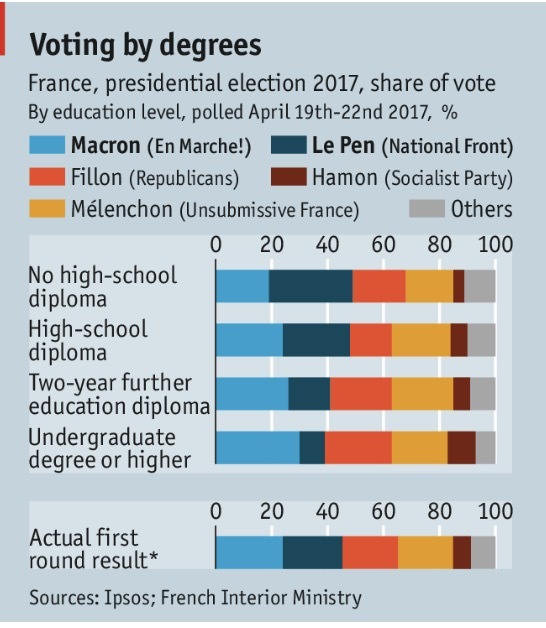 The first round voting was close but Macron was the ultimate winner securing 24% of the vote, with Le Pen in second place. 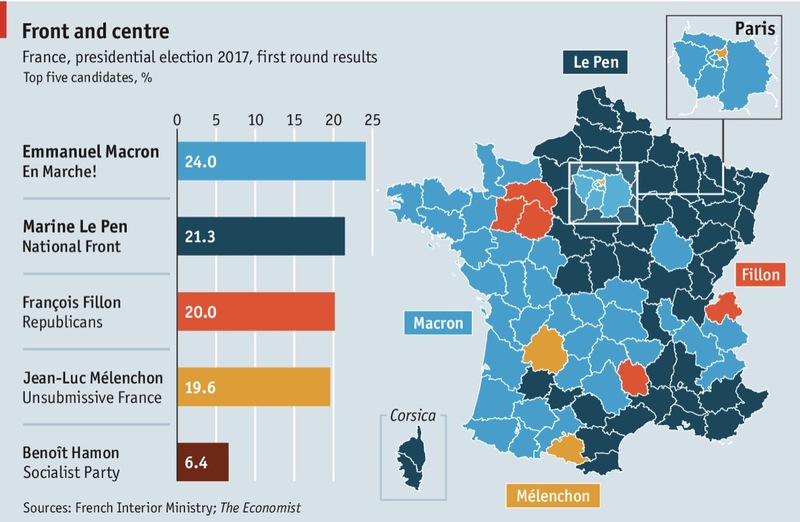 There are some similarities to the Trump election in the composition of voting, where Le Pen is appealing to the 'rust belt' in France, gaining support from those negatively impacted by globalisation. Finally, we finish on the voting intentions of French voters for the Final Round and note that unlike the US election and Brexit, the French polls have been very accurate. The polls currently suggest a comfortable victory for Macron - but we are likely to be more comfortable once the final result is known. Australian Cricket - is it over for Free to Air TV? Trump's election as US President - has it changed the world that much? Hugh Giddy and Anton Tagliaferro (Investors Mutual senior management) recently wrote about the Trump induced rally in share markets. The title of their publication is "Trump's election as President - has it changed the world that much? The article covers their views of the US and China in particular, written in an easy to follow manner, and littered with some amusing quotes. You can download your copy of this article by clicking on the icon below. Mark Draper (GEM Capital) recently spoke with Clay Smolinski (Platinum Asset Management) about the threat to retailers of Amazon. Clay talks about how investors should be thinking about Amazon. Mark Draper and Shannon Corcoran (GEM Capital) recently met with Dom Guiliano (Chief Investment Officer - Magellan Financial Group) to talk about Donald Trump's agenda and how investors should be thinking about it. We also covered the risks with European politics, particularly in France and Germany, with so many elections coming up in 2017. Telstra is a favoured stock among many retail investors, assumingly for the current high franked dividend. While Telstra's balance sheet is in pristine condition, which would allow it the flexibility to borrow in order to support this dividend, we remain concerned about Telstra's earnings outlook. 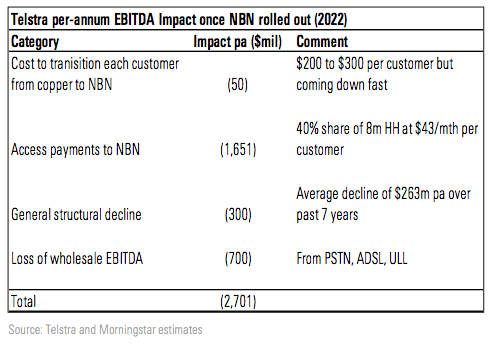 Not only have earnings virtually gone nowhere over the past decade, the NBN is likely to pressure Telstra's future earnings in the absence of a new growth stragegy. NBN is a game changer for all Australian telecommunications companies as it results in them becoming a reseller of the NBN service, rather than selling their own data networks which attracted a higher margin. This is likely to leave a 'black hole' in earnings for Telstra in coming years once the NBN is rolled out. This is clear in the table below. While the above table is forward looking, there is not much joy in earnings in the rear vision mirror for Telstra share holders. This graph shows earnings per share, which have virtually 'flat-lined' over the past decade. Source of this data is Skaffold software. We conclude this article with a 3 minute video from Michael Glennon (Small Cap Investor) who outlines the reasons he does not wish to invest in Telstra. Can ethical investing and good returns co-exist? Over the last few years, there has been a significant increase in the interest in Environmental, Social and Governance (ESG) investing. According to a paper released recently, over $8trn of the $40trn of money managed in the USA is now under some form of Sustainable and Responsible Investing (SRI) or ESG, up 33% since 2014 and up fivefold from $1.4trn in 2012 for money run by fund managers. In many respects Australian fund managers have been caught unready for this change. 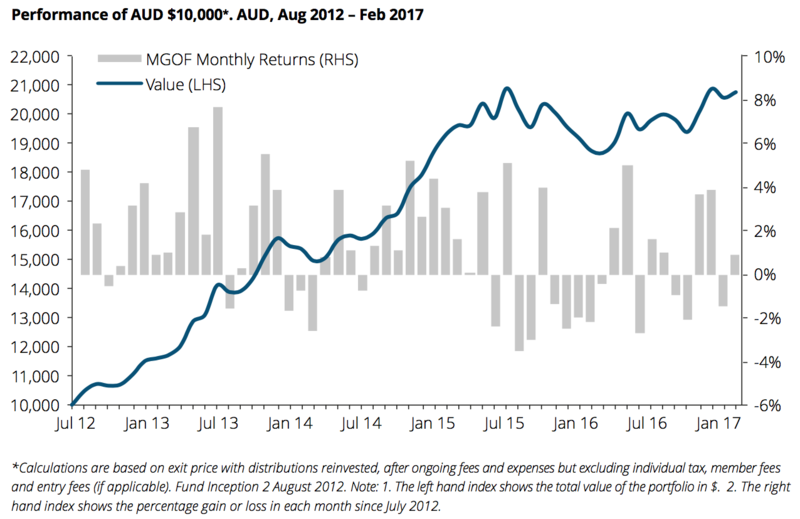 If we look at the Mercer survey data for January 2017, the Global Equities strategy section contains 127 global funds that are sold in Australia. Of this, only 5 are classed as SRI funds. It is somewhat better for Australian equities with 157 funds in the survey, of which 13 are SRI. If we were to use the ratio of assets in the USA, the number of SRI funds should be 27 and 34 respectively. One reason could be that there is a view amongst many people (and particularly fund managers) that “you can’t have your cake and eat it too”: that SRI results in lower returns for investors and the investors have to pay a price to be responsible. In some ways this misconception, of accepting lower returns for being ethical, goes against another tenant of conventional investing wisdom: buy good businesses. The grandfather of long term investing, Warren Buffett, discusses a lot in his letters to shareholders the importance of ethics and the quality of the character of the people running the businesses he owns. Implicitly he is saying that businesses that have an ethos and focus on ‘doing the right thing’ by staff and customers, should generate higher returns. Now admittedly he is discussing the character of the people rather than the nature of the business, and some people would find owning Coca Cola unethical. And it is this differentiation between good people and bad unethical businesses that opens an interesting next line of inquiry. Download the complete 4 page report from Morphic Asset Management by clicking on the link below. To see a general property crash – say a 20% plus average price fall - we need to see one or more of the following: a recession - which looks unlikely; a surge in interest rates - but rate hikes are unlikely until 2018 and the RBA will take account of the greater sensitivity of households to higher rates; and property oversupply – this would require the current construction boom to continue for several years. However, the risks on the supply front are high in relation to apartments. Australian shares delivering around 9%pa income sounds too good to be true. In this article, we take a look at a couple of professionally managed investment strategies that have been able to achieve this over the last 5 years. 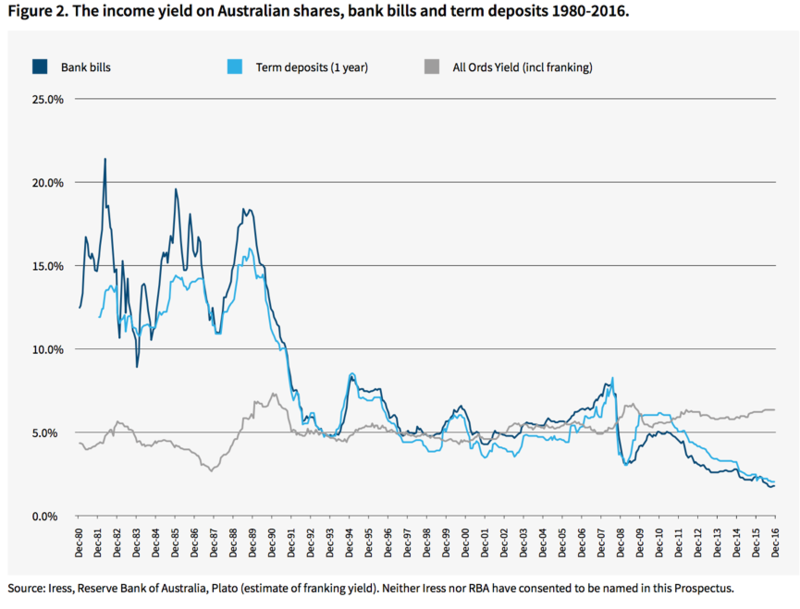 The Australian share market currently offers investors a higher income yield than cash, with potential for capital appreciation over time as can be seen in the chart below. While the income yield from Australian shares is above 5%pa (incl franking) some professionally managed funds employ strategies to enhance this yield for income hungry investors. Plato Investment Management are launching a listed investment company (called the Plato Income Maximiser) which uses the strategy of the Plato Australian Shares Income Fund that has been in operation for over 5 years. This fund is unique in that it is a long only fund (not using derivatives) that achieves higher income by buying securities on the ASX300 in the lead up to a dividend payment and then selling once the dividend has been paid. Historical evidence shows that share prices tend to appreciate in the lead up to a dividend payment, which the fund uses to boost returns. In the 5 years to 28th February 2017 this strategy returned income to investors of 9.1%pa with some capital appreciation. CEO of Plato Investment Management, Dr Don Hamson talks about the Plato fund with Commsec in the video below. Other high income equity strategies focus on investing into high income stocks, and then bolster income by writing call options over some of their holdings. A call option is an agreement that gives an investor the right but not the obligation to purchase a share at a specific price during a specific period in exchange for a financial payment. Many investment managers offer this style of high income equity fund including Investors Mutual, Colonial First State, AMP just to name a few. For example an investor who owns 1,000 CBA shares could write a call option that would allow another investor to purchase their shares for a set price of say $90 (currently CBA trading at around $83) and in exchange for this agreement, receives a payment. This payment is considered additional income over and above the dividend that the investor receives. In the event that the CBA share price rose above $90 it is likely that the investor who wrote the call option initially, would be obligated to sell the CBA holding for $90. Therefore it is important to understand that an investment strategy revolving around writing of call options carries the risk of limiting the upside when share prices rise. These strategies tend to outperform during flat or ‘down’ market conditions and underperform during strong markets. We are not criticising equity income strategies that use call options, we are merely making a comparison which demonstrates the limiting of upside. Below we have compared the Investors Mutual fund that use call options, to the Plato fund which does not. The figures are to the end of February 2017 sourced from company websites. Readers can see the limiting of upside returns in the strategy using call options over the last 12 months when the market has been positive. Both of these managers are highly rated, so the purpose of the comparison is not to place one manager above the other, simply to highlight the difference in strategies during a period of strong market returns (which is shown in the 12 month numbers). We would also highlight that the soon to be listed, Plato Income Maximiser is a listed investment company, which is different to the other income funds which are available in the format of a unit trust. The benefit for SMSF trustees of investing in a listed investment company structure is the ability of the company to smooth dividend payments, where as a unit trust must pay out all income received to investors during the financial year in which it is received. This can result in income being somewhat ‘lumpy’. Finally the other difference between a listed investment company and a unit trust is that investors can purchase units in a trust by purchasing them directly from the investment manager, where as a listed investment company must be purchased via the ASX, or in the case of Plato Income Maximiser, can be purchased in the IPO which closes in April 2017. This blog article is of general nature only and describes the new fund and is not in itself making an investment recommendation. Investors are urged to read the prospectus and seek professional advice before investing. The prospectus can be downloaded by clicking on the 'Download' icon below. Jack Lowenstein and Chad Slater formerly from Hunter Hall are about to list the Morphic Ethical Equities fund. Morphic was established in 2012 and has managed the Global Opportunities fund in that time which has generated a 17%pa return for investors since its inception. Morphic is 30% owned by Westpac, and 70% owned by management, an ownership structure that we like. Jack Lowenstein will be putting in significant money of his own into the listed investment company which is further evidence that management's interests are aligned with share holders. Morphic Ethical Equities fund will also have the ability to short stocks, (take a position to profit from a falling share price) and interestingly may short companies that fail it's ethical screen. Investors who apply for shares in the IPO will receive a share of $1.10 in addition to an option for each share they purchase. The option allows them to purchase an additional share at the same price of $1.10 in the next 18 months, or alternatively the option will carry some value and may be traded on the market. We have spoken to the managers of the IPO - who have received good support from investors and they are anticipating that Morphic is likely to raise around $100m in this offer. Management fee is 1.25%pa of net asset value of the fund which is reasonable for a global fund, plus a performance fee if the fund returns better than the international market. GEM Capital is likely to receive an allocation of shares in this fund and the advisers will be co-investing into the fund too. CEO Jack Lowenstein recently spoke on Sky Business News to Peter Switzer and we bring you that interview below. Of course before investing, investors should seek professional advice and read the prospectus which can be downloaded below by clicking on the "Download" icon.